* Performance layer and raised grain design, 80% of life longer than normal reflector,and reflectivity could be up to 90%. * Collapsible & Collected, portable bags with more feature, good help to far away from dust, scratches. Easy get close to your subjets by 5 different color: Translucent, Silver, Gold, White and Black. The sliver strengthens the contrast and increase highlights. The gold side works basically the same way, while adding a warmer color to the image. The white side brightens up the shadows to produce a softer light. The black side just the opposite, and is used to subtract light and create shadows in certain areas. All items from Abaige are providing 30 days worry-free money back and one year limited warranty. 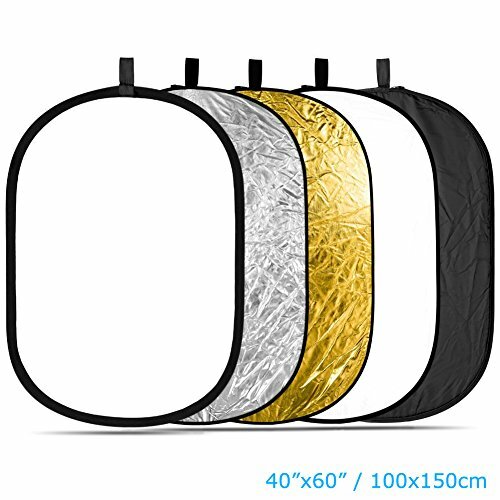 5 in 1 Photography Studio Collapsible Multi Photo Disc Reflector: Translucent, Silver, Gold, White, and Black. Functional, different color fit to different usage of photography, effectively increased your creative and photo passion. Quality Layer and Raised Grain Design, 80% of life longer than normal reflector,and reflectivity could be up to 90%. Collapsible & Collected, portable bags with more feature, good help to far away from dust, scratches. Quality ensured - 30days money free and one year limited warranty. If you have any questions about this product by Abaige, contact us by completing and submitting the form below. If you are looking for a specif part number, please include it with your message.